South Korea, Japan may put the F-35B stealth fighter on combat-capable ships Jeff Daniels	Thu, 28 Dec 2017 - John Pike, a military analyst at Globalsecurity.org, said the F-35B would give the South Koreans stronger fleet air defenses and formidable ship-to-shore ground attack capabilities "that you wouldn't want to mess with." Furthermore, he said, putting the versatile fighter on a mobile platform at sea would make it harder to destroy than if the plane were at an airfield. 2018 is when something finally gives on North Korea The Kim regime might be open to arms-reduction talks, noted John Pike, a military analyst at Globalsecurity.org, to Quartz. Has the FBI 'become America's secret police,' like the KGB? By Louis Jacobson on Friday, December 8th, 2017 - Pike of globalsecurity.org said that, while there’s a need for vigilance, "there does seem to have been a remarkable absence of abuses of these far-reaching powers." He added, "Whatever happens to you down at the J.Edgar Hoover building, you are pretty confident it will not entail a bullet to the back of the head." The reason Army helicopters are named after native tribes will make you smile By Harold Hutchison Dec. 03, 08:02 PM - According to GlobalSecurity.org, this was originally due to Army Regulation 70-28, which has since been rescinded. Today, while the regulation is gone, the tradition remains, and there is a procedure to pick a new name. UN: Houthi Rockets Fired at Saudi Arabia Appear Iranian Reuters/New York - 1 December, 2017 - The Qiam-1 has a range of almost 500 miles and can carry a 1,400-pound warhead, according to GlobalSecurity.org public policy organization. This Is America’s Secret Plan for Fighting the Next Korean War Michael Peck - December 1, 2017 - OPLAN 5015 envisaged the possibility of a preemptive strike against North Korea. “The new plan was said to adapt to changes in the security environment by focusing on making a swifter and more energetic military response than the previous OPLAN 5027, incorporating the concept of a preemptive strike,” according to Globalsecurity.org. Kaspersky Russian Spying Rumors: Should You Use This Antivirus? by PAUL WAGENSEIL Nov 16, 2017, - John E. Pike, founder and director of GlobalSecurity.org, a national-security think tank, said Kaspersky antivirus software was "probably" safe to use, but he added that "such products have too much spaghetti code for anyone to have confidence that they understand all that is going on under the hood." Can Trump be trusted with the nuclear launch codes? Can any president? Ralph Vartabedian OCT 30, 2017 - Throughout the Cold War and in the quarter-century since, the U.S. has never renounced the first use of nuclear weapons. It threatened to use tactical nuclear weapons against Soviet Union forces if they attempted to overrun Western Europe; and it has indicated it could use them in response to biological or chemical attacks on the U.S. or its allies, said John Pike, executive director of GlobalSecurity.org, a Washington-based military analysis firm. This .50 cal machine gun fires twice as fast as the legendary Ma Deuce We Are The Mighty (blog)-Oct 19, 2017 GlobalSecurity.org notes that Ma Deuce plus a tripod comes to 128 pounds, 84 of which are the gun. The GAU-19 comes in at 106 pounds – so your vehicle's adding 22 pounds. The Worst Defense By Fred Kaplan Slate - OCT. 17 2017 - According to John Pike, director of GlobalSecurity.org, the Aegis tests align the interceptor, the target-missile, and the point where the two collide along a straight line; when it’s fired from a side angle, it tends not to work. US Warplane Drop Banned White Phosphorus Bomb on Syria Published 27 September 2017 - GlobalSecurity.org has said that the chemical leaves deep skin burns and only stops combusting when deprived of oxygen, which generally results in victims being burned to the bone. The chemical can also stick to clothing or remain in buildings and infrastructure putting others at risk of coming into contact with the substance even after it has been ignited. Ft. Knox and Ft. Campbell Army bases in Kentucky appear safe from closing, at least for now Sep 26th, 2017 By Tom Latek Kentucky Today - The website globalsecurity.org said Fort Campbell was spared from massive cuts after the Budget Control Act of 2011 sequester, but two brigade-sized elements, about 6,000 soldiers, were removed from the division’s highest strength of more than 35,000 soldiers. US Denies Reports it Opened Military Base in Israel 21.09.2017 ccording to GlobalSecurity.org, a “main operating base” includes a command and control center, family support structures (churches, fast food joints), and permanently stationed soldiers. Argentina is buying a new warship from America that is making the Brits nervous By Harold Hutchison - We Are The Mighty -Sep 7, 2017 - “The British would have to increase their protection of the Falklands in light of Argentina acquiring an amphibious assault ship,” John Pike of GlobalSecurity.org told the Daily Mail. THE NORTH KOREAN NUCLEAR QUANDARY By James H. Nolt SEPTEMBER 7, 2017 - A military solution is widely rejected across the political spectrum from right-wing Steve Bannon, President Donald Trump’s former chief strategist, to most liberals, including military experts such as John E. Pike, director of GlobalSecurity.org. China Breakthroughs: Charging ahead on HyperFlight Transport at supersonic speeds By Tom McGregor, CCTV.com Panview commentator and editor 09-05-2017 ?CCTV.com - According to GlobalSecurity.org, CASIC owns 6 research institutes, 2 research and production bases, 16 subsidiary companies, including 7 listed enterprises and public institutions. Russia plans to build 100 of its next generation Armata tank Business Insider-Aug 30, 2017 - The T-14 is part of the Armata Universal Combat Platform, which is is based on a single chassis that that can be used for a variety of Armata armored vehicles — not just the T-14 tank. This interchangeable platform, according to Globalsecurity.org, includes "standard engine-transmission installation, chassis controls, driver interface, unified set of onboard electronics, [and] life-support systems." This deadly gun is the Navy’s last line of defense against a missile attack By Harold Hutchison August 29, 2017 - The Styx is a primitive missile. According to GlobalSecurity.org, it has a range of up to 54 nautical miles, based on the variant, and travels at 90 percent of the speed of sound, or around 600 miles per hour. This deadly gun is the Navy’s last line of defense against a missile attack By Harold Hutchison August 29, 2017 - We Are The Mighty - The Styx is a primitive missile. According to GlobalSecurity.org, it has a range of up to 54 nautical miles, based on the variant, and travels at 90 percent of the speed of sound, or around 600 miles per hour. Here Is America's Battle Plan for Destroying North Korea Michael Peck August 29, 2017 - “The new plan was said to adapt to changes in the security environment by focusing on making a swifter and more energetic military response than the previous OPLAN 5027, incorporating the concept of a preemptive strike,” according to Globalsecurity.org. Watch this Russian Su-35 fighter make what seem like impossible aerial moves By Harold Hutchison - We Are The Mighty 25.08.2017 - Today, Russia has acquired 58 of the Su-35s, and plans to buy as many as 90, according to GlobalSecurity.org. To put this into perspective, the similar Dassault Rafale has over 160 airframes, with orders from India and Qatar pending. WATCH: China’s NORINCO Unveils Next-Gen Infantry Fighting Vehicles Sputnik 23.08.2017 - In 2003, Washington sanctioned NORINCO and its subsidiaries for allegedly contributing to Iran’s missile program. The state-run firm makes civilian products like machinery, chemicals, construction machinery and vehicles in addition to its products for the Chinese military, which is the company’s dominant source of business, GlobalSecurity.org reports. Why Corruption Persists In The Philippines Despite Duterte's Tough Anti-Graft Talk Ralph Jennings - Forbes 22 august 2017 - The Philippines shows a “natural tendency...of cabinet secretaries to run their departments as independent fiefdoms,” defense research website GlobalSecurity.org says, calling corruption the second biggest barrier to doing business in the country after lack of infrastructure. “Bribes, payoffs, and shakedowns characterized Philippine government and society at all levels," the website describes. This is India's version of the A-10 Warthog By Harold Hutchison Aug. 17, 01:38 PM - We Are The Mighty - GlobalSecurity.org noted that India carried out one upgrade starting in 2002, which included new navigation systems, improved target tracking systems, and a cockpit that made things easier for the pilot. What is an ICBM and how would the US defend against it? If unprotected personnel are nearby at the point of detonation, small levels of hydrochloric acid could be inhaled by them, but it is unlikely that much more than eye and upper airway irritation will be experienced, according to John E. Pike, who now directs GlobalSecurity.org. South Korea Tests Massive Bunker-Busting Missile sputniknews.com - 23:56 02.08.2017 - As the video demonstrates, the dummy in the cave opening didn’t fare well against the South Korean-made missile. 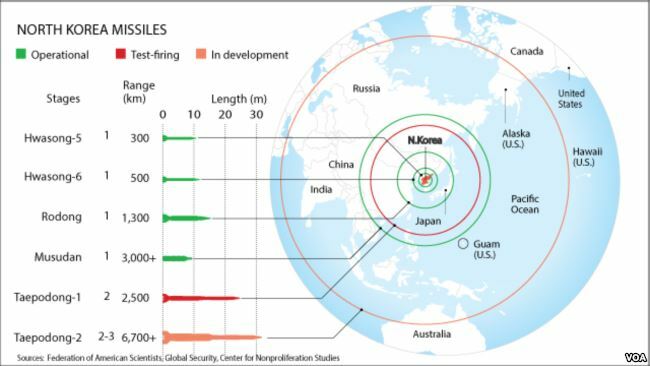 The Hyunmoo-II has a range of 800 kilometers, according to GlobalSecurity.org. North Korea's Latest Missile Gets Its Title From Mars, the Planet Named for a War God By Julia Glum Newsweek.com August 1, 2017 -- "North Korean missiles have too many designations chasing not enough hardware," GlobalSecurity.org writes, explaining that missiles first had Soviet names but were then later identified by the village where they first appeared. Nowadays, "most North Korean missiles have been given an alphanumeric designator in the Hwasong sequence, the word Hwasong being a Korean word meaning powerful, innovative or sacrifice." Can the US really stop China’s access to American AI tech? By Doug Tsuruoka Asia Times July 29, 2017 -- “Anyone concerned about US national security would have to be concerned about the Chinese making off with crown jewels such as AI,” John Pike, an intelligence expert who heads the military think tank GlobalSecurity.org told Asia Times. 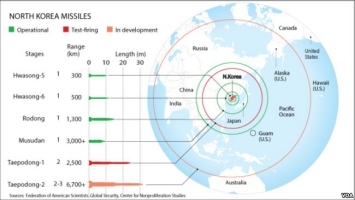 North Korea has tested another intercontinental ballistic missile — here's what that is, how it works, and why it's scary By Dave Mosher Business Insider July 28, 2017 -- "ICBMs create a problem because they enable a country to break out of a regional context and move toward potential global impact," Pike, who now directs GlobalSecurity.org, wrote in 1998. Vintage World War II photos show Texas military base preparing for war By Craig Hlavaty Chron.com / Houston Chronicle July 26, 2017 -- According to GlobalSecurity.org, NAS Corpus Christi's tenants include the Corpus Christi Army Depot, Chief of Naval Air Training, the U.S. Coast Guard, the Drug Enforcement Agency, a Medical Naval Hospital, Mine Warfare Command, and a Defense Distribution Depot. Rash of Diarrhea Deaths Hits Indonesia’s Papua Province By Victor Mambor BenarNews July 26, 2017 -- Papua’s adult literacy rate is the lowest among all of Indonesia’s provinces, standing at 74 percent, according to the website GlobalSecurity.org. Campaign stresses Offutt’s importance, while congressman says installation is safe from next round of base closures By Scott Stewart, Eugene Curtin & Joseph Morton The Daily Nonpareil July 18, 2017 -- John Pike, a military analyst and director of GlobalSecurity.org, he said it’s hard to see how Offutt would end up on the chopping block now. ¿Qué países tienen los misiles más peligrosos? el observador July 15, 2017 -- Desde los años 70, China ha probado unas siete versiones del misil sobre el que el gobierno chino es hermético, según un informe de globalsecurity.org. China to Open Its First Overseas Military Base in Djibouti Normangee Star July 13, 2017 -- One of the world’s most important sea lanes, millions of barrels of oil and petroleum products pass through the strait daily, according to GlobalSecurity.org. China sends troops to Djibouti, establishes first overseas military base CNN Wires July 12, 2017 -- One of the world’s most important sea lanes, millions of barrels of oil and petroleum products pass through the strait daily, according to GlobalSecurity.org. Marine Corps plane crash kills 16, highlights training hazards By Tom Vanden Brook USA TODAY July 11, 2017 -- Military training requires risks to prepare troops for combat, said John Pike, executive director of GlobalSecurity.org. Military training flights can be particularly dangerous because they often require low-altitude flying, sharpening pilots’ skills to avoid detection by the enemy. Iran gets North Korean expertise in building up, testing and hiding its ballistic missiles By Rowan Scarborough The Washington Times June 20, 2017 -- Iran owns one of the world’s largest inventories of ballistic missiles. GlobalSecurity.org lists more than a dozen different short- and medium-range Iranian missiles, some of which closely resemble North Korea’s Nodong arsenal. Super PAC ad campaign touts Bacon’s effort to keep Offutt open – but it’s not in danger of closing By Joseph Morton Omaha World-Herald June 12, 2017 -- John Pike, a military analyst and director of GlobalSecurity.org, noted that there are indications a new attempt at base closings is coming. Still, he said it’s hard to see how Offutt would end up on the chopping block at this point, citing that expensive new StratCom headquarters. Lorenzana: US forces in Marawi coordinated communications link By Froilan Gallardo MindaNews June 11, 2017 -- According to globalsecurity.org, the P-3s were active in Afghanistan in late 2001, “where the aircraft used Ku-band packet mux data links to provide video and other sensor data to surface forces. Wreckage of Missing Myanmar Military Plane Is Found By Jane Perlez and Wai Moe The New York Times June 7, 2017 -- A website specializing in assessments of air safety standards said the Y-8 aircraft was configured to carry a maximum of 96 soldiers or 82 paratroopers. The website, GlobalSecurity.org, also said the plane could take 60 wounded soldiers and their stretchers. Iran Drops Plan to Send Human Into Space, Citing Cost By Rick Gladstone The New York Times May 31, 2017 -- Charles P. Vick, an independent analyst formerly with GlobalSecurity.org, a defense intelligence research group, said Iran’s scientists had also encountered “a lot of technical problems” in developing launch vehicles for human spaceflight. Upgrading U.S. nuclear missiles, as Russia and China modernize, would cost $85 billion. Is it time to quit the ICBM race? By W.J. Hennigan and Ralph Vartabedian Los Angeles Times May 30, 2017 -- The reevaluation of the role of ICBMs in America’s defense comes in an era when nuclear weapons are proliferating, not fading away. GlobalSecurity.org director John Pike, who has analyzed U.S. military systems and strategies for more than three decades, says critics “are gaining no traction” in calling for the elimination of the ballistic missile fleet. Was Trump’s NSC aide sidelined for being too hardline? By Doug Tsuruoka Asia Times May 18, 2017 -- “It would be easy to be guilty by association with Flynn… Some might regard anybody that was too close to Flynn as being radioactive,” said John Pike, a nonpartisan intelligence expert who heads the military think tank globalsecurity.org in Washington, DC. Does the president have 'the ability to declassify anything at any time'? By Louis Jacobson Politifact May 15, 2017 -- "The important caveat is that ‘legal’ and ‘sensible’ may be different things," said John Pike, the director of globalsecurity.org. "It may be legal, but it may fail to avoid the appearance of impropriety." North Korea Missile Test Appears to Tiptoe Over a U.S. Tripwire By William J. Broad and David E. Sanger The New York Times May 15, 2017 -- Charles P. Vick, an expert on the North’s missiles at GlobalSecurity.org, a private research group in Alexandria, Va., said the United States had a history of using high missile trajectories as a way to intensify the returning warhead’s trial by fire. Iran just tested an advanced torpedo in the Strait of Hormuz By Harold C. Hutchiso We Are The Mighty May 10, 2017 -- According to GlobalSecurity.org, Russia designed the Shkval as a “revenge weapon” for use by submarines to take out a ship or submarine that fired on them. The original Shkval was tipped with a nuclear warhead. It is Not Just North Korea But Asia That is in US Crosshairs By Mathew Maavak Sputnik April 25, 2017 -- As Globalsecurity.org succinctly puts it: "The role of Combined Forces Command (CFC) during the armistice is to deter war. US Hits Hundreds of Syrian Tech Workers with New Sanctions By Lou Lorscheider VOA News April 24, 2017 -- The website GlobalSecurity.org alleges that the development of chemical weaponry at the center is secretly aided by Russian chemical experts. US vice president Mike Pence travels to Seoul to discuss military response to North Korean aggression By Rob Crillyr The Telegraph April 16, 2017 -- According to globalsecurity.org, an invading North Korean army would be met by 140 M1A1 tanks, 170 Bradley armoured vehicles and 100 aircraft, including 70 F-16 fighter planes. ISIS fighters killed by ‘MOAB’ By Madeline Patrick Normangee Star April 16, 2017 -- The 9.8-tonne guided bomb, the largest non-nuclear weapon in America’s arsenal, is described by the US-based GlobalSecurity.org watchdog as “large, powerful and accurately delivered”. Guide to the 'Mother of All Bombs' By Shannon Collins Scout.com April 15, 2017 -- According to global security.org, it’s the largest-ever satellite-guided, air-delivered weapon in history, made to replace the unguided 15,000-pound BLU-82 Daisy Cutter that was used in Vietnam and early on in Afghanistan. Meet the Americans on the Front Line If North Korea Goes to War By Corky Siemaszko NBC News April 15, 2017 -- Should Kim Jong Un send his soldiers over the DMZ, they would be met by an American military machine with a lethal arsenal of conventional weapons, according to GlobalSecurity.org. How Powerful is the 'Mother of All Bombs'? Here's a Look AFP April 14, 2017 -- The 9.8-tonne guided bomb, the largest non-nuclear weapon in America's arsenal, is described by the US-based GlobalSecurity.org watchdog as "large, powerful and accurately delivered". "You use a bomb like this to send a message" Newcastle Herald April 14, 2017 -- John Pike, director of GlobalSecurity.org, a military policy research website, said the bomb is a "gee-whiz weapon," not a tactical one. Air Force drops ‘mother of all bombs’ in Afghanistan By W.J. Hennigan The Courier-Tribune April 13, 2017 -- John Pike, director of GlobalSecurity.org, a military policy research website, said the bomb is a “gee-whiz weapon,” not a tactical one. Countries Hit By U.S. Tomahawk Cruise Missiles Since Desert Storm [Infographic] By Niall McCarthy Forbes.com April 7, 2017 -- According to website GlobalSecurity.org, the U.S. fired over 1,100 Tomahawks between the Gulf War in 1991 and the intervention in Afghanistan in 2001. Russian surveillance flight passes close to Rock By Brian Reyes Gibraltar Chronicle March 25, 2017 -- According to the military information website GlobalSecurity.org, the aircraft in question has additional duties including environmental monitoring, mapping and geological survey. China pursues air-launched rockets By George Leopold Defense Systems March 24, 2017 -- The state-run enterprise has also developed most of China's frontline ballistic, anti-ship and cruise missiles as well as "tactical microsatellites," according to the web site GlobalSecurity.org. Columbia-based Department 13 develops software to thwart drone threats By Sarah Gantz The Baltimore Sun March 23, 2017 -- John E. Pike, director of the military information website GlobalSecurity.org, said he thinks the threat of enemy drones is overblown. What chemical weapons N. Korea possesses By Sarah Gantz The Associated Press February 25, 2017 -- The military information website GlobalSecurity.org said that North Korea has at least eight industrial facilities that can produce chemical agents. OPLAN 5015: The Secret Plan for Destroying North Korea (and Start World War III?) By Michael Peck The National Interest March 11, 2017 -- “The new plan was said to adapt to changes in the security environment by focusing on making a swifter and more energetic military response than the previous OPLAN 5027, incorporating the concept of a preemptive strike,” according to Globalsecurity.org. Inside the Green Berets’ Hunt for Wanted Warlord Joseph Kony By Mac William Bishop NBCnews.com March 6, 2017 -- "I imagine Observant Compass would be quietly wound down and renamed," said Joseph Trevithick, a fellow at GlobalSecurity.org and a freelance journalist who has written extensively about AFRICOM. Stopping North Korea in its tracks Associated Press March 5, 2017 -- The military information website GlobalSecurity.org claims that North Korea has at least eight industrial facilities that can produce chemical agents. Four questions about when senators meet with ambassadors By Louis Jacobson Politifact March 2, 2017 -- And in the case of Russia, some lawmakers would have good reason to have a meeting with a Russian diplomat, but most would have "have little business with the Kremlin," said John Pike, director of globalsecurity.org. Tại sao Trung Quốc khiếp hãi tàu sân bay Mỹ VietTimes February 27, 2017 - Theo trang Globalsecurity.org, vi?c tái tri?n khai l?c lu?ng tên l?a t?m xa còn ti?p di?n trong nam 1996 và quân d?i Trung Qu?c dã chu?n b? s?n sàng d? hành d?ng quân s?. Who Is Canada's Biggest Defense Contractor? The Motley Fool February 20, 2017 -- GlobalSecurity.org puts it even more bluntly. These days, "the Canadian defense industry is recognized as part of a single North American defense industrial base." Why China Fears (And Plans to Sink) America's Aircraft Carriers By Kyle Mizokami The National Interest February 19, 2017 -- According to Globalsecurity.org, redeployments of Chinese long-range missile forces continued into 1996, and the Chinese military actually prepared for military action. Did Donald Trump inherit 'a mess' from Barack Obama? By Louis Jacobson Politifact February 06, 2017 -- It was a "mistake" by Obama to goad Russian President Vladimir Putin by calling Russia a "regional power," Rubin said, and Obama’s relative inaction against the annexation of the Crimean region of Ukraine "was a tragic mistake on his part," said John Pike, director of globalsecurity.org. F-35 sale to Taiwan? A test of Taiwan and Trump By John Pike The Washington Times February 14, 2017 -- "The United States might sell the F-35 stealth fighter to Taiwan. Although no formal request has been made, the logic of the idea is impeccable." Donald Trump wrong that media is not reporting on terrorism any more By Louis Jacobson Politifact February 06, 2017 -- John Pike, director of globalsecurity.org, agreed. "There are some incidents of such trivial nature that local authorities are hard put to decide whether it is terrorism or hooliganism," Pike said. "But if an American or European civilian or officer is seriously injured or killed, it gets reported." 24 ‘Islami Samaj members’ sent to jail By FM Mizanur Rahaman, Chittagong Dhaka Tribune February 06, 2017 -- According to GlobalSecurity.org, a military issues think tank, Islami Samaj is a break away faction of Jamaat-e-Islami and was established on May 17, 1997 by the party founder ameer Mufti Abdul Zabbar who in 1983 formed a dissident group of Jamaat following his disagreement with Jamaat leader Golam Azam. 24 ‘Islami Samaj’ men held while ‘plotting sabotage’ By FM Mizanur Rahaman, Chittagong Dhaka Tribune February 05, 2017 -- According to GlobalSecurity.org, a military issues think tank, Islami Samaj is a break away faction of Jamaat-e-Islami and was established on May 17, 1997 by the party founder ameer Mufti Abdul Zabbar who in 1983 formed a dissident group of Jamaat following his disagreement with Jamaat leader Golam Azam. Could Russian Tank be Better Than US Abrams? We Are the Mighty January 24, 2017 -- According to Globalsecurity.org, the T-90 is an evolutionary development of the T-72. It has the same gun as the tank that flopped during Desert Storm, but it did feature some new survivability enhancements, like the TShU-1-7 Shtora-1 optronic countermeasures system. How Thai Air Force acquire Gripen fleets The Nation January 14, 2017 -- The Royal Thai Air Force ordered a complete aircraft and command and control system from the Swedish Defence Materiel Administration in a government-to-government deal, according to GlobalSecurity.org website.